Brett Hickey was a name not many lacrosse fans knew before 2015. If anything, some fans knew he had been on Vancouver and never panned out. 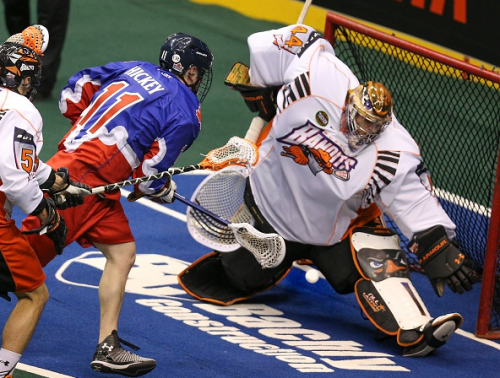 Now, fans who follow the NLL know exactly who Brett Hickey is and what an impact he has made. Hickey is on the Toronto Rock, who are in first place in the east, and have become a scoring juggernaut. That’s a great story in itself, but consider the fact they are without their captain, traded away last season’s top scorer, and this season’s top scorer was injured! Toronto traded away Garrett Billings, their leading scorer last season, to New England for Kevin Crowley at this year’s trading deadline due to a contract dispute with Billings. Crowley is now one of the big guns on offense and adds to Hickey’s skills. Hickey was a member of Vancouver last season and was released. Now that he’s one of the leading men on offense for the Rock, he was knew what kind of an opportunity it was to show the Stealth they were wrong. Hickey’s career season has included 68 points in the 16 games he has played. Before this season he had accumulated just 10 points in nine games! “I think it’s just about being part of a completely unselfish offense.” he said. “We are a six man offense. I think our offense clicks when all six guys are moving and touching the ball and it forces teams to extend and have to guard five players each time our offense is on the floor. Regardless of who is putting up the goal there is probably three or four other little plays that another player or players have done to allow that person to score, so our success is collective in my opinion. As long as we win that is all that matters.